Force V will decrease at this point and be balanced by force W. 3. To reduce mat thickness, tilt the screed plate so that less material crowds under the screed plate. 4. The amount and condition of the material, leaving the auger, can change the equilibrium of the four forces. Excessive flow of material increases force H. A cold, stiff mix will increase H and to some extent V. An excessively hot, fluid mix decreases H and V. Stopping and starting the paver also cause changes in equilibrium among the forces. The key to controlling the action of the screed is to maintain in a uniform manner those forces acting on the screed. 5. The secret of good paver operations is a balance of the forces and uniformity to maintain that balance. When balance and uniformity are attained, the screed path follows the paver in a plane parallel to that of the pivot point. As the paver goes up over an irregularity, the pivot point rises and the screed begins to rise also. However, because the screed reacts to changes in elevation more slowly than the pivot point does, the screed rises very little and thereby maintains the plane of the surface of the mat over the irregularity, and the impact of the irregularity is reduced. The same is not true of long irregularities (longer than several lengths of the paver). Grade line irregularities of this type should be corrected before placing surface courses with the paver. 6. Screeds, equipped with tamping bars and vibratory mechanisms, are designed to strike off and then compact the mixture slightly, as it is placed. The two purposes for this screed action are that it achieves maximum leveling of the mat surface and ensures that minimum distortion of the mat surface occurs with subsequent rolling. TAMPING BAR TYPES OF SCREEDS Tamping bar types of screed compactors compact the mix, strike off the excess thickness, and tuck the material under the screed plate for leveling. As figure 16-41 shows, the tamper bar has two faces: . A beveled face on the front that compacts the material, as the screed is pulled forward. l A horizontal face that imparts some compaction, but primarily strikes off excess material, so the screed can ride smoothly over the mat being laid. The adjustment that limits the range of downward travel of the tamping bar is the single most important adjustment affecting the appearance of the finished mat. At the bottom of its stroke, the horizontal face should 16-38 extend one sixty-fourth of an inch (about the thickness of a fingernail) below the level of the screed plate. When the bar extends down too far, mix builds upon the screed face. This buildup scuffs the surface of the mix being placed and also causes the tamping bar to lift the screed slightly on each downward stroke, and this often causes rippling of the mat surface. When the horizontal face of the tamping bar is adjusted too high (either by poor adjustment or due to wear of the bottom of the horizontal face), the bar does not strike off excess mix from the mat. Consequently, the screed plate begins to strike off the material, and this results in surface pitting of the mix being placed because the leading edge of the screed plate drags the larger aggregates forward. For this reason, the tamper bar should always be checked before operating the paver, and it should be adjusted if necessary. Before the tamper bar approaches knife-edge thinness, it should be replaced. VIBRATING TYPES OF SCREEDS. The operation of vibratory screeds is similar to that of tamping screeds, except that the compactive force is generated either by electric vibrators, rotating shafts with eccentric weights, or hydraulic motors (fig. 16-43). On some pavers both the frequency (number of vibrations per minute) and the amplitude (range of motion) of the vibrators can be adjusted. In others, the frequency remains constant and only the amplitude can be adjusted. Frequency and amplitude must be set according to the type of paver, the thickness of the mat, the speed of the paver, and the characteristics of the mixture being placed. Once set, the frequency and amplitude do not normally need adjustment until the mat thickness or mix characteristics change. 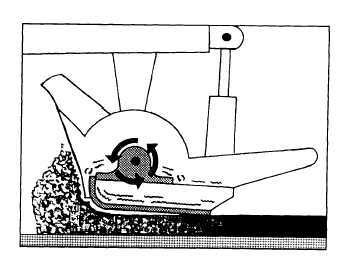 Figure 16-43.-Vibratory type of screed.